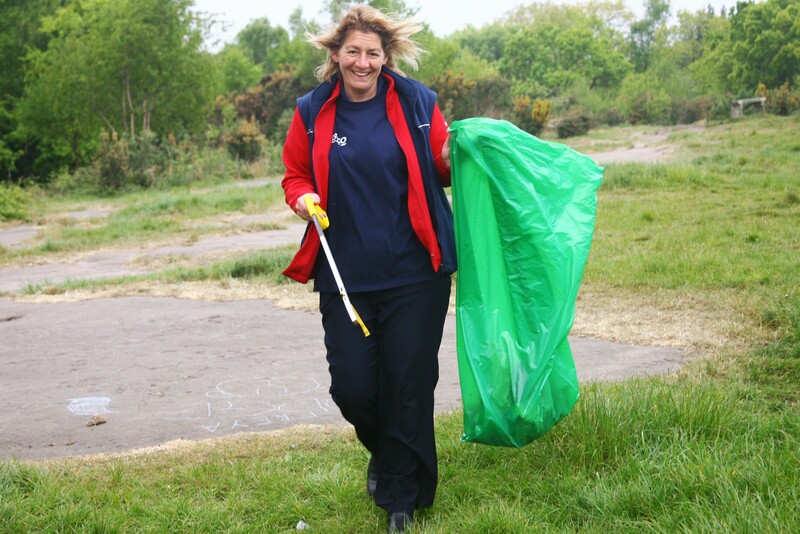 We regret that the Bidston Hill Spring Clean has been cancelled. This was scheduled for Sunday 4th March as part of the Great British Spring Clean. Although the snow on Bidston Hill is beginning to melt, there is still a yellow warning of ice in the morning and a high probability of sleet. Conditions should improve a little in the afternoon, but at best the air will be cold and the ground will be wet and slippery. Under the circumstances, we have decided that it is safer not to go ahead. Now that spring is on its way we can tell you our plans for the Hill over the coming months. 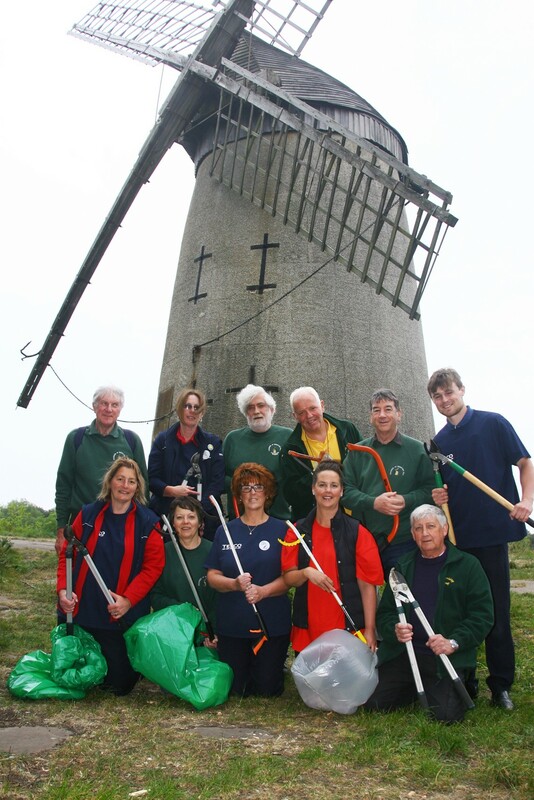 Our Windmill is open to the public from 10 till 12 on the first Saturday of each month starting 7th April. The last opening will be 1st September. The Windmill will also be open on Sunday, 13th May, from 11 till 1pm, for National Mills Weekend. This is also the day of our Family Open Day when there will be lots going on, including a chance to look around inside the Lighthouse, and Windmill. Other attractions take in our Heritage Trail, consisting of some ancient rock carvings, Punch & Judy, Viking Display, Guided Walks, Maypole, Novelty Chocolate and Candy Floss stalls, refreshments and more. Renovations continue at Bidston Observatory with the aim for restoration and refurbishments to be completed early summer 2018. General public access will be possible in September, during the Wirral Heritage Open Day on pre booked tours. Plans for a visitor centre continue with 2019 hopefully seeing an exhibit open during the same hours of Bidston Lighthouse. We also hope this year to have a video screening during the summer months on Saturdays, twice a month, looking at the history of the building and the work undertaken within. More news soon, once building works are completed! 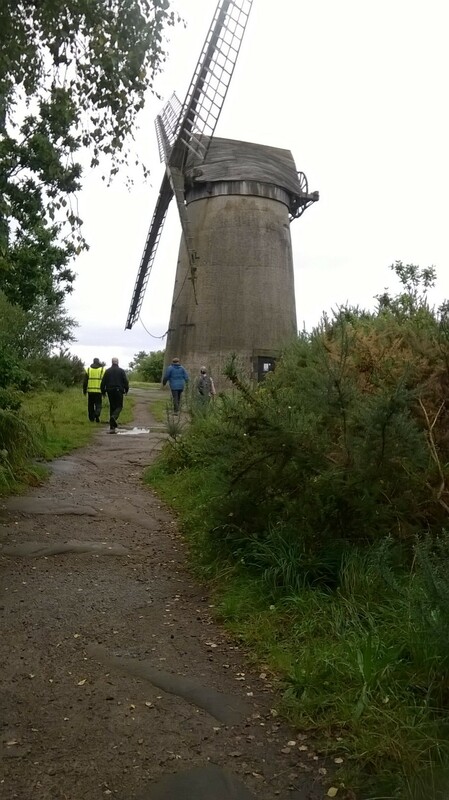 Finally, I thought I would mention our Friday Group, some of you may be aware of our volunteers who work alongside Wirral Council in the maintenance of Bidston Hill. 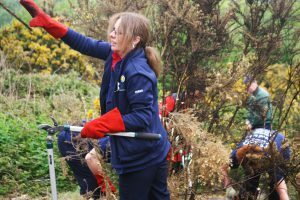 We undertake all sorts of tasks throughout the year, including path clearance, shrub and tree pruning, litter picking and much more. We meet each Friday morning at 10am at the Tam O’Shanter Farm café, when we have a chat (sometimes a cup of tea) before going on the Hill to start work. 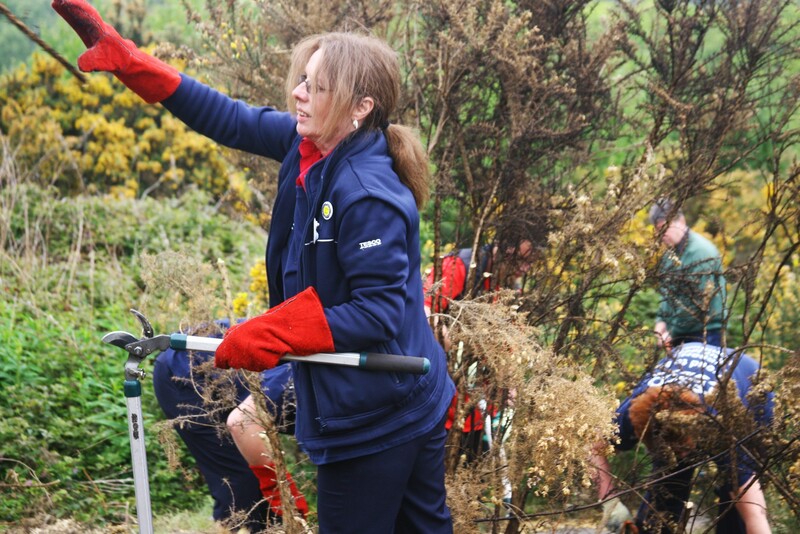 We usually work for a couple of hours and there is no commitment, volunteers can come and go as they please. It is best to wear some good walking boots or wellingtons and warm clothes. All are welcome and the work is very rewarding. We are pleased to advise that the Friends of Bidston Hill have agreed to assist Wirral Hospice in the raising of funds for their Christmas tree collections & recycling initiative. Fundraising Co-Ordinator Elaine Connell said: “We are running the Christmas Tree Collection and Recycling Scheme again this year in order to raise vital funds for the Hospice and helping towards our £3.6 million pounds running costs”. The collections are taking place between 6th and 11th January 2018 and a donation of £5 for a small tree and £7 for a medium to large tree is suggested. If you would like further information or, wish to ask any questions, Elaine can be contacted on 0151 343 0778. On behalf of the Friends of Bidston Hill may I wish them every success in raising funds for this extremely worthwhile cause. There were at least four people on each work day in October. On 6th October a visitor to Bidston Hill said he had seen a Land Rover Discovery being driven over the Hill. This was reported to the Police along with the registration number. John Jakeman was also informed. Bebington Police have agreed to put extra patrols in the area. The plan to cut back Birch during the Autumn/Winter has continued and this month attention was paid to Oak Tree Heath which is to the left of Vyner Road bridge. A number of tall Birch trees have been cut down together with smaller ones, some Gorse and Rhododendron bushes. Many Heather plants have been revealed and these should grow better next year as a result of them receiving more light. In Mid-October, bushes and trees around the car-park were pruned back. The working party went international in November when students from the Wirral Metropolitan College came to spend two mornings on Bidston Hill. Accompanied by two members of staff, 29 students came to help out. They were all learning to speak English but seemed to have quite a good grasp of the language and were given a tour of the Hill. Also, Stephen gave them a brief talk about the Observatory and Lighthouse and most of the students seem to appreciate this lesson in history. 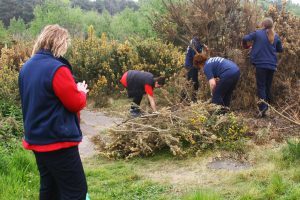 After the tour, the group set about cutting down Birch and Gorse on North Heath, alongside the diagonal path from Wilding Way to the Rock Carving. The College staff indicated that the Hill visits had been very beneficial to the students and hinted that they may come back in the Spring 2018. On average, six/seven people attend the Friday Group. A number of tool purchases have been made, the FOBH now have 2 pairs of secateurs, 2 pairs of shears, 4 pairs of simple loppers, 4 pairs of extending loppers. All have been engraved FOBH and a number. It is planned to buy some bow saws and this will make the Friends independent of the Farm for tools. On North Heath, near to the Windmill, burnt gorse has been cut down and birch cleared away from heather growing area. 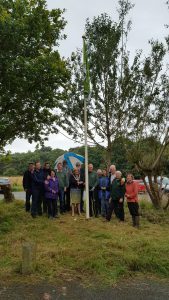 A large party turned out in early August to cut away ivy and sycamore from the sandstone walls of the Observatory and Lighthouse: thank you Fiona for the bacon butties! 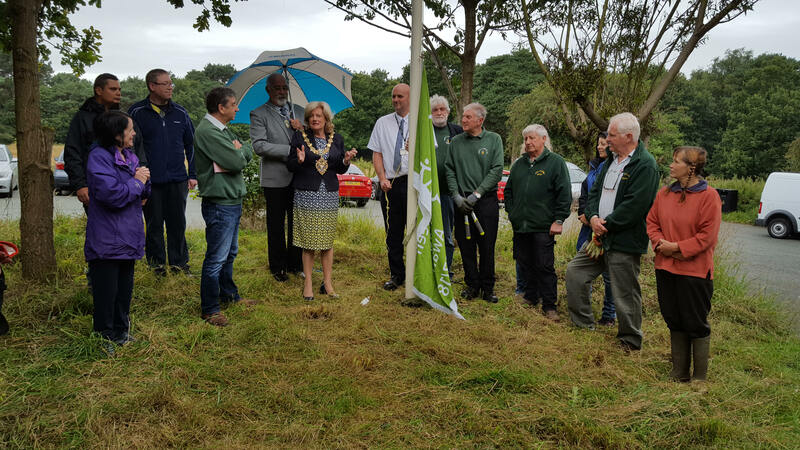 August 11th was Green Flag Award Day and the Mayor of Wirral came to the Hill and raised the flag. On South Heath between the bridge and Taylor’s Wood, Heather Heath has been created: Heather in flower was being covered and smothered by gorse and much of the gorse has been cut away to reveal the heather. It is by the main path to the Windmill and much used by visitors, they were able to see a large amount of heather in flower. On Tree Stump Heath (North Heath, below Windmill) birch has been cut down to encourage heather growth. Last Friday we were assisted by 9 people from the DWP office; they enjoy coming and working hard and another group is expected in October. Also, Gaultheria creeping stems have been pulled out from this heath to stop it spreading. At this time of the year, the main activity is birch removal. This tree seeds early and profusely so the more the plant can be cut, the less birch seeds will be created. The group tends to spend 2 to 3 weeks on one patch of ground in order to achieve a substantial growth removal on that area. We then move onto another piece of heathland. 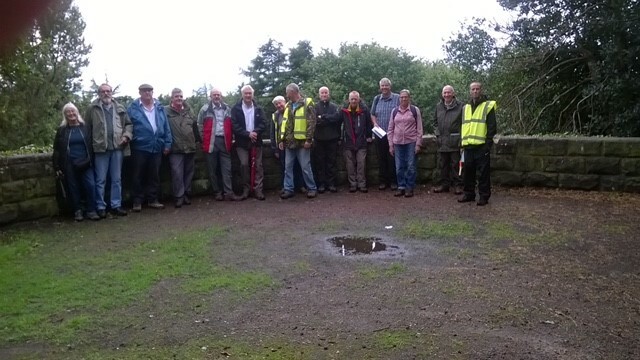 On Tuesday, September 5th, I conducted a walk on Bidston Hill and was helped by three members of the Friday Group, Jon, Jayne, and Terry. Jayne took the photos which you can see below. The walk explored King George’s Way, Thermopolyae Pass, the original site of Bidston Court, (later moved to Royden Park), Bidston Windmill, Observatory and Lighthouse. In addition, we visited some of the ancient and interesting Rock Carvings before returning to Tam O’Shanter Farm. 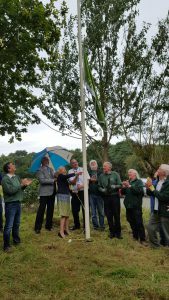 Last Friday, the Friends of Bidston Hill and the “Friday Group” volunteers assembled to celebrate Bidston Hill’s Green Flag award for 2017. The guest of honour was Ann McLachlan, Mayor of Wirral and Councillor for Bidston and St. James. 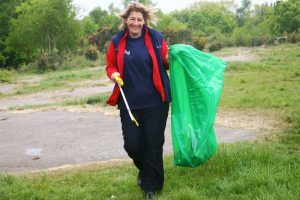 I would like to welcome and thank our Madame Mayor for Wirral, who, in a few moments, I would like to ask to raise our flag in recognition of the hard work our volunteers have put in over the last 12 months, working hand in hand with Wirral Council for the benefit of Bidston Hill and surrounding areas. Once again, the Hill has received the coveted Green Flag Status Award for yet another year! 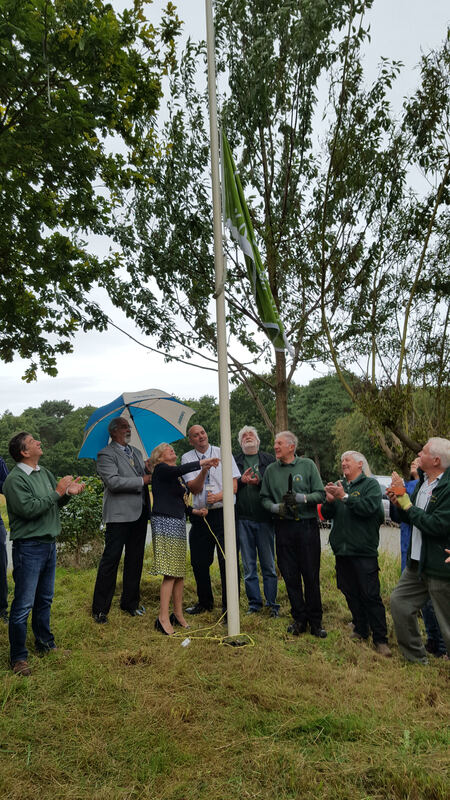 The Green Flag Award is the mark of quality given in recognition of achieving the national standard for parks and green spaces. 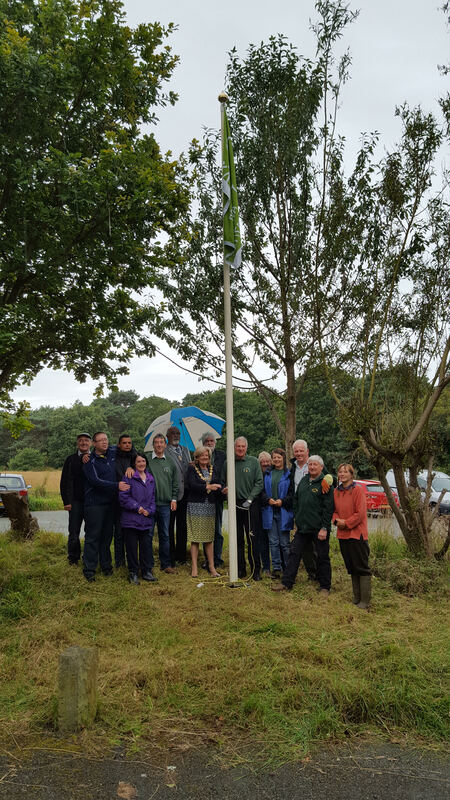 Much credit for the continued green flag status should go to our Friday Group that works all year through, irrespective of what the weather is throwing at them! It is through such dedication and love for the Hill that makes it possible for us all to enjoy this beautiful conservation area throughout the seasons. The Friends of Bidston Hill invite you to a family picnic on Bidston Hill on Saturday, 8th July, from 12 noon until 5 pm. The venue is the field adjacent to the main car park on Bidston Hill (on Boundary Road, near Tam O’Shanter Urban Farm, postcode CH43 7PD). Our picnic is one of several hundred “Have a Field Day” events happening across the UK to bring communities together and celebrate our parks and green spaces. All that’s needed is you, your family, a picnic and liquid refreshment. There will be NO burger stands, NO beer tent, NO tacky souvenir stands and NO admission fee. It’s free! All children should be accompanied and supervised by a responsible adult. Please don’t bring fragile glassware and crockery for your food and drink – paper or plastic items are much safer. For more information, call Kevin on 07596 157234. 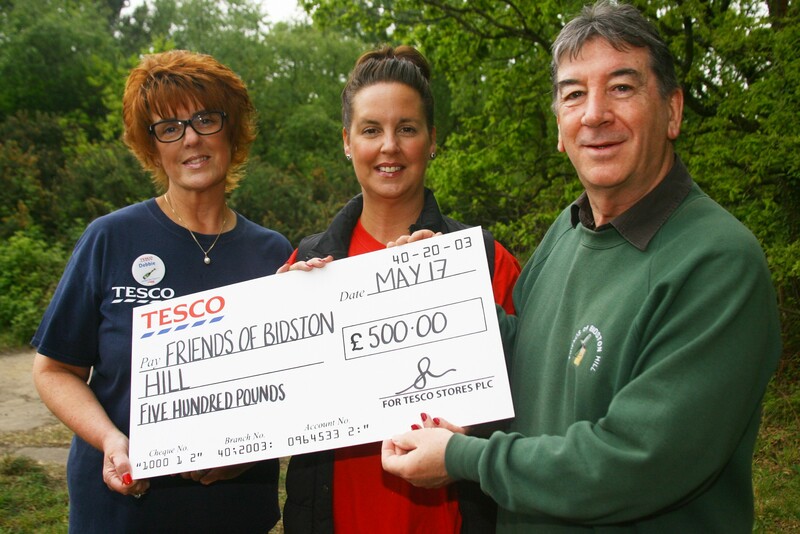 We were delighted to hear from Tesco recently when they kindly advised they would like to make a donation to the Friends of Bidston Hill. In addition, they wanted to send along some willing employees of the store to assist with some of the maintenance chores our volunteers carry out each Friday morning (weather permitting). We met at the Tam O’Shanter Farm around 10am and we briefed the staff on the type of work we do on the hill, our voluntary Bidston Hill Warden, John Lee, explained what we would be doing for the next couple of hours. After collecting the tools for the job from the workshop, we proceeded to the location of the Windmill, where John gave out instructions to begin to cut down an area of burnt gorse that had recently been gripped by fire. During the summer months, there can be a lot of fires on the hill and the local fire service is often called. In addition, John suggested some of us could embark upon a trail of litter picking. 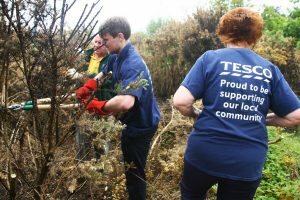 To our delight, the Tesco staff worked their magic (every little helps!) and the area was soon cleared of the burnt gorse and surrounding litter – job complete. The morning finished with Tesco presenting us with a cheque for £500 which was gratefully accepted, this will be put towards replacement and additional tools/utensils for the ongoing valuable work undertaken by our volunteers. 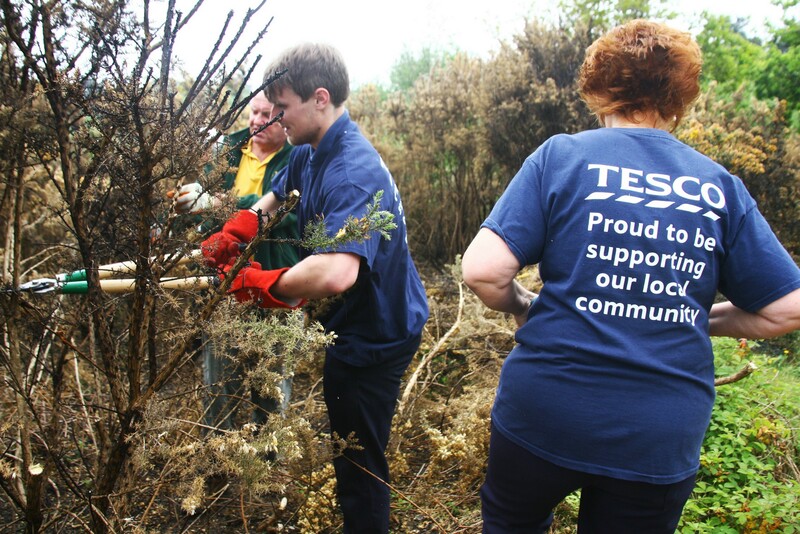 Below are some photos showing work in progress – well done Tesco staff and thank you for your kind donation!